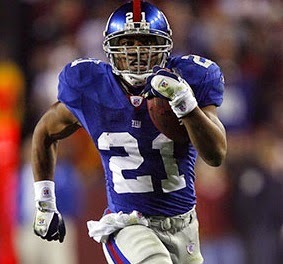 Barber was chosen by the Giants in the second round of the 1997 NFL draft with the expectation that he would be a third-down back and kick returner in the mold of former star RB Dave Meggett, and while he started a few games, that was largely the role he filled for his first three seasons. From 1997 to ’99, he rushed for 935 yards while catching 142 passes for 1256 yards (8.8 avg.) that included a high of 66 for 609 yards in 1999. Adding in kick returns, Barber gained 1639 all-purpose yards. He became part of an effective tandem with rookie Ron Dayne in 2000, and while Dayne wore down as the season progressed, Barber rushed for 1006 yards on 213 carries (4.7 avg.) and caught 70 passes for 719 yards (10.3 avg.). He co-led the team in ’01 with 72 pass receptions, for 577 yards, and had 865 rushing yards. The biggest concern was a tendency to fumble, but he was a surprisingly effective inside runner as well as a breakaway threat on the outside and skillful receiver. Barber shouldered more of the load in 2002 and ’03, gaining 1984 yards from scrimmage in ’02 (1387 rushing, 597 receiving) and 1677 in 2003 (1216 rushing, 461 receiving). Giants went 6-10 to finish second in the NFC East. Barber led the NFL in all-purpose yards at age 30 in 2005 with 2390 and missed the league rushing title by twenty yards with 1860 on 357 carries (5.2 avg.). He received consensus first-team All-NFL as well as Pro Bowl honors. Barber followed up in 2006 with 1662 rushing yards and 58 catches for 465 yards to end up going over 2000 yards from scrimmage for the third straight year with 2127 and was named to a third consecutive Pro Bowl. He chose to retire to the broadcast booth having rushed for a franchise-record 10,449 yards on 2217 carries (4.7 avg.) and gained another 5183 yards on 586 pass receptions (8.8 avg.). Barber also returned 122 punts for a 9.7-yard average and averaged 20.1 yards on 27 kickoff returns. He scored a total of 68 touchdowns. His twin brother Ronde had a 16-year career as a cornerback for the Tampa Bay Buccaneers.